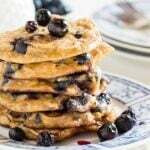 Blueberry Almond Protein Pancakes are low carb and gluten free, yet will satisfy your cravings for pancakes in a healthy way. They are absolutely bursting with blueberries. So much so, you really don’t need to add much syrup to these pancakes. Plus, these pancakes have protein powder added in. If you’re like me and you struggle to get enough protein, this is a huge bonus. 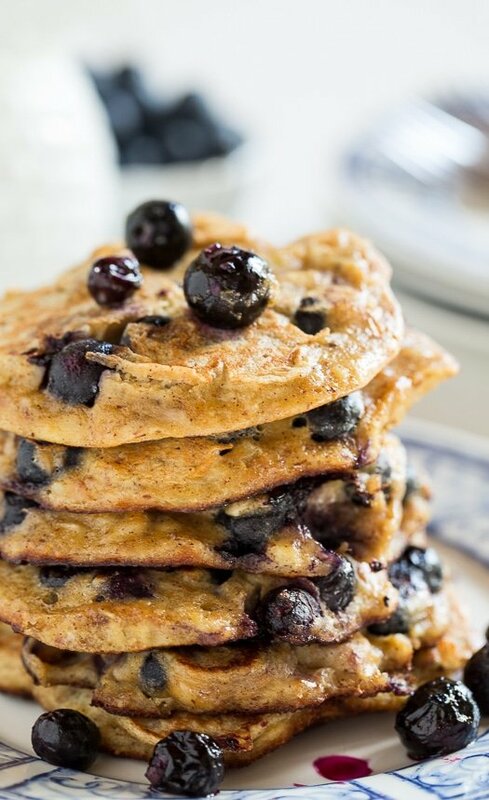 Blueberry Almond Protein Pancakes are so scrumptious, it’s hard to believe there’s no flour in them. Instead almond meal is used along with a banana (very ripe), an egg, some almond butter, vanilla protein powder, and cinnamon and almond extract for flavoring. This recipe is definitely not the type of recipe I usually post. That is- it’s healthy. Now I love a good old southern casserole, a biscuit slathered with butter, and a slab of pie. But I can’t eat that way all the time. So I’ve decided to share some of the healthy things I eat too. Ordinarily if I want pancakes for breakfast, I want Buttermilk Pancakes. 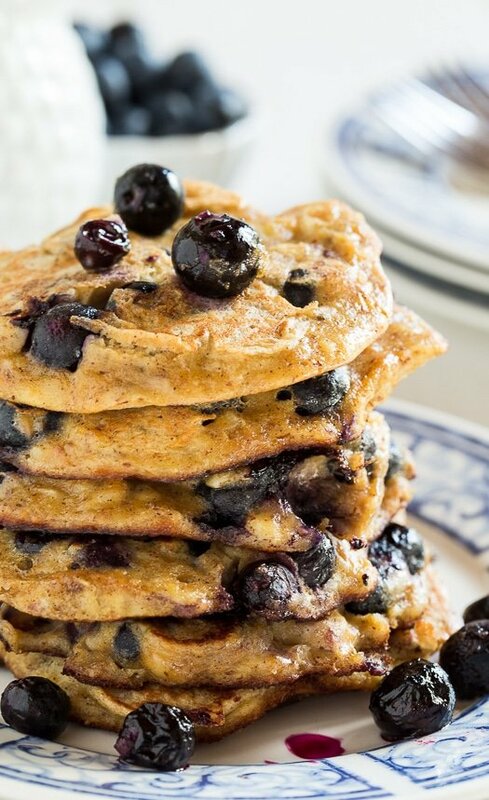 But if the pants are fitting a little snug as they usually do after the holidays, these Blueberry Almond Protein Pancakes are a good alternative. I love how full of blueberries they are and the almond butter and banana give then just enough sweetness that you only need a touch of maple syrup. Note: You can buy almond meal at some grocery stores or you can buy Almond Meal online. You can also make your own by grinding whole almonds until finely ground. 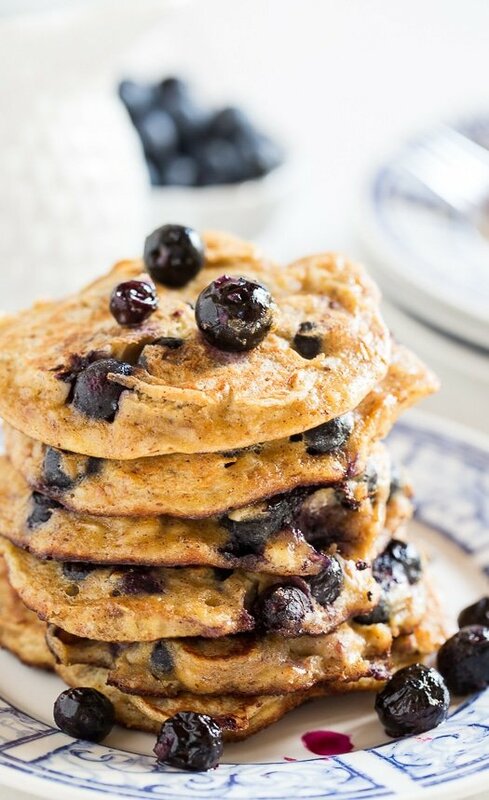 Blueberry Almond Protein Pancakes are bursting with blueberries and are a healthy way to start your day. Gluten-free and Paleo-friendly. Mix all ingredients in a bowl, adding blueberries last so they don’t get smashed. Grease a griddle or large nonstick pan with coconut oil. Using 1/4 cup measuring cup, pour batter onto griddle. Cook until undersides are browned, flip and cook until pancakes are set all the way through. Disclosure: There are amazon.com affiliate links in this post. This entry was posted in Breakfast, Healthy and tagged blueberries, healthy, pancakes. Bookmark the permalink. I made these this morning and they were difficult to turn, so watery. I added some Chia seeds and more almond flour to it and they turned out very good. Thanks for the sharing your tips for making the recipe work for you Tammy! Waste of ingredients!!! These pancakes are super mushy that you can’t even flip. I don’t recommend this recipe to anyone! 1st bad experience using Pinterest recipe. Made these for brunch today – LOVED them! So juicy, wonderful texture and consistency. I mistakenly omitted the almond butter (one of my favorite things, so rather shocking really) but they still ended up quite delicious! Thanks for the recipe. I just tried making these and ended up with a pile of wet mush that I really couldn’t get to firm enough consistency to flip. I must admit that I used frozen but thawed blueberries, so there might have been too much liquid. Otherwise, they taste great and are very sweet! I cannot imagine adding syrup to them! I wish I’d read your comment. This was my first try at a high protein pancake. I do not eat animal products, and needed more protein at breakfast. Big mush pile for sure! I did use the ground flax/water mix for egg replacement. I’ve never had a problem using egg replacements before, but maybe that’s why this recipe didn’t work. 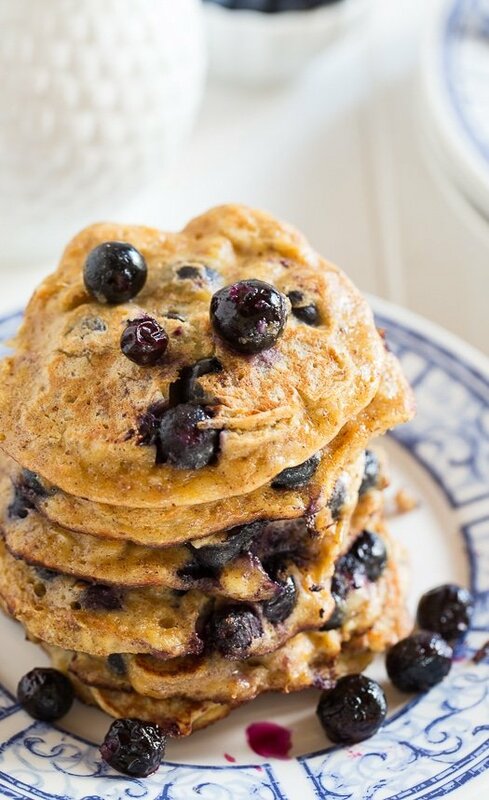 I love blueberry pancakes but never have tried adding protein powder before – can’t think of a better or more healthy way to start my morning off than with a stack of these! I love the combination of almond flour and banana as the base for these pancakes! It’s nice when a sinful tasting breakfast isn’t so sinful! These look incredible! I want to dive right in! My hubby loves pancakes; however, I rarely serve them because they are full of carbs. This is a healthier version chock full of all my favorite clean ingredients. Pancakes might just be in order for this house. Pinned and will make. Hope you like them Lynn! I have most of a bag of almond meal that I need to use up – these pancakes look like a perfect way to do that! And blueberry / almond is suchhh a good combo! Love pancakes! Especially when they look so good! I think I found my new Sunday morning pancake recipe! Loving these! These look incredible! I’m with you, I love to indulge but I don’t think I’d be missing anything (even the syrup!) with these pancakes. Wow!! These look amazing!! ..and they’re gluten free?? …and low carb?? for the win!! I need some of these pancakes in my life!! 🙂 Great recipe girl! YAYAYYYY for healthy, gluten free pancakes! – though at first I thought I was on another blog and not yours 🙂 These are my kind of pancakes!!! So glad you posted something healthy! Hope you have a wonderful weekend! LOL! I was worried people would think they had gone to the wrong blog! Hope you have a wonderful weekend too Shashi! I absolutely cannot wait to make these pancakes, Christin! My mom is on a no-grains, high-protein diet so I’m positive she will love these! It definitely can’t hurt that they look absolutely gorgeous too. 🙂 Pinned and definitely trying asap!